Unnakka kappa / dry tapioca is basically tapioca that has been washed, cleaned, sliced / diced and dried in the sun. This will keep for years without going bad. Soak them in water for at least 6 – 8 hrs to make them soft, when you need to use them. 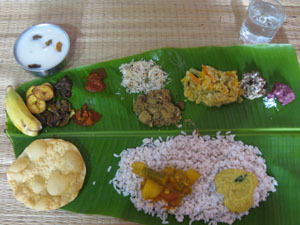 Puzhukku, tapioca chips and puttu are some of the dishes that can be prepared with dry tapioca. Dry tapioca puzhukku is prepared in the same way as fresh kappa but the taste differs a lot. It has a unique taste of its own and goes really well with fish curry / kanthari mulaku chammanthi or any other spicy chutney/curry of your choice. 1. Wash the unnakka kappa pieces well and soak them overnight in enough water. If you are using dry tapioca that has been cut lengthwise, break it down to cubes with your hands. Crush grated coconut with garlic, green chilly, turmeric and curry leaves. You can pulse 2-3 times in a mixer. Keep aside. 2. Cook the tapioca pieces in a pressure cooker for 2 -3 whistles(or until soft) adding enough water (around 3-4 cups). When the pressure releases, open the pressure cooker and drain the water. Add the crushed coconut-green chilli mixture, few curry leaves and salt to the cooked unnakka kappa. Mix well and mash the tapioca. Cook for a few minutes. Check for salt. You can add 1-2 tsp of coconut oil if you wish. You can season it with mustards and dry red chilly if you wish. Very new recipe. Never cooked with Tapioca before. I have never tried cooking with dry tapioca.Nice concept. Yeah, totally new to me as well. But who dries that Tapioca? We do it or they sell it as is? New one to me. I have seen dry tapioca chips and used to like it a lot !! Looks delicious gals !!! wow…very tempting..nothing can beat kappa & fish curry. Never tried dried tapiocas.Perfect clicks & nicely explained. Wow this luks very nice,this is very new to me. while seeing the pics,make me hungry.Wanna try this. Tapioca is new to me…..and the recipe too…..looks tasty….. This recipe is quite new to me. I have never tried tapioca ….. ur’s looks good and flavorful. Yummyyy.Love this with kanthari mulaku chammanthi. wow… perfect with kudampuli etta meen curry! Totally new recipe..never cooked with tapioca before ! Very tempting puzhukku..never had them before.. I used to polish off my Keralian friend’s stash of Tapioca chips. this is a great way to preserve them. love the kottu recipe. Wow yummy..ethu njankaludeyum favorite aanu..kazhichittu ethara naalayi.. I ve never made this unakka kappa. Do you make it at home?? Looks delicious, out of my realm! It is easy to dry tapioca. Wash, pat dry and slice / dice them. It wont take more than 1-2 weeks to dry them in the sun. You can also find them in the stores.